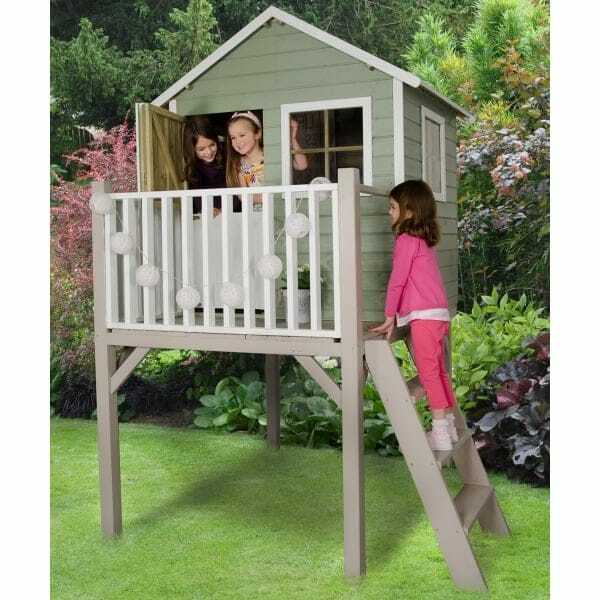 Forest Garden Sage Tower Playhouse: This wooden playhouse is bursting with outdoor entertainment and excitement. The playhouse stands 1 metre above the ground so will give the children that raised tree house retreat feeling. There is a sturdy 3 step ladder for the children to climb up and a viewing platform with wooden railings on 3 sides. The playhouse benefits from styrene glazed windows for safety and a split stable style door so that children can look out and let you know if they need any extra supplies bringing over! This wooden playhouse has a quality finish with 12mm tongue and groove walls and a timber boarded roof and floor. The building is pressure treated to give it a long lasting rot free finish that does not require yearly treatment. The wooden can be painted to your own style if required but is supplied in a natural finish. The underneath of this playhouse can be used for storing garden toys to keep them dry.